When rock was beginning, though they had a surprising amount of artists who were at the very least novices on record, it wasn’t as if they were being manufactured from scratch in a laboratory somewhere, put in a box and marketed as “Rock ‘n’ Roll Artists”, selling for $1.49 on the shelf at your local store. They had to come from somewhere with at least SOME awareness of music that existed before rock’s sudden creation. Furthermore plenty of established artists were not altogether dismissive of the music when it came along. In fact many may have been inching in that direction already by the time rock came careening into view. Yet why is it that in a very short time the line of demarcation between styles was drawn rather clearly and some eagerly jumped into the emerging field with both feet while others just peered into the mist, trying to make out just what in the heck was going on over there, maybe stuck a foot over the line and tested the ground only to find it a little unsteady before pulling back, turning around and retreating to whence they came? Here, hopefully, are some of the answers. Little Willie Jackson didn’t need rock ‘n’ roll. He already had a steady gig playing behind Joe Liggins who, as we’ve mentioned before, was one of the preeminent bandleaders in the style immediately preceding rock. In fact Jackson, who was blind I suppose I should mention, not that it matters, was the co-founder of the group along with Liggins in 1944, though they’d played together even earlier than that dating back to the 1930’s in San Diego. In 1945 they scored the single biggest hit of the decade with “The Honeydripper” which was #1 on the race charts for an astounding 18 weeks and helped to open up the market for more authentic black music that wasn’t pandering for white pop acceptance. The group of course, as befitting the era they all came of age in, was a good deal more refined than what followed a few years later with rock ‘n’ roll, which Joe’s younger brother Jimmy excelled in. The elder Liggins, while certainly capable of playing to that more uncivilized crowd, wasn’t interested in trading his old audience for a new one, nor did he have to. 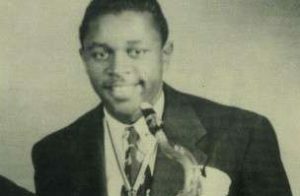 Joe Liggins would score big hits for another couple of years, including one (“Pink Champagne” in 1950) that rested atop the now-renamed R&B Charts for 13 weeks at the height of the rock era. All of their records were classy and with a touch of elegance that set them safely outside of the rock borders. So why is Little Willie Jackson, who recorded with Liggins for a lifetime and was the last of The Honeydrippers left standing, passing away in 2001 at 88, fourteen years after Liggins’s death, slumming on his own with the rock crowd? Well, for the first of what promises to be many times here on Spontaneous Lunacy we need to go back to the 1948 recording ban to find one of unintended side-effects of the work stoppage heading into the new year. With record labels obviously needing to sell product in order to keep afloat they needed a huge supply of new records, something they going to be unable to procure once 1948 rang in and recording ground to a halt. So anticipating this and knowing there was only so much they could expect to get from their current roster of artists in the last few weeks of ’47 when they ran sessions around the clock to stockpile material, these small independent labels with limited rosters to begin with frantically searched elsewhere for viable alternatives. 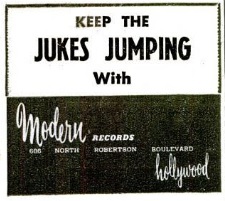 Modern Records of Los Angeles quickly cast out a wide net in the hopes to snagging some skilled musicians who were somehow not yet signed to other companies in a last ditch attempt to simply get some records cut that MAY be good enough to sell. But where do you find such artists? Well, one place was by convincing sidemen in successful bands to step out on their own for a few quick bucks and maybe to try and get some glory under their own name. This wasn’t quite in the same boat as outright defection and so it’s wasn’t as big of a deal as it might seem. There may have been a mild risk involved for established bandleaders who might wind up losing a qualified musician should that session yield enough fruit for the sideman to hand in his resignation to go out on their own, lured by potential stardom, but that was unlikely and it was a calculated gamble at best, since the opportunity also provided Liggins with some advantages. Namely it was a way to reward a loyal soldier and keep Jackson happy, but it was also a chance to perhaps promote another “act” for their live shows, letting Jackson open the gigs with a few numbers that might be recognizable to an audience who bought the records, then once the crowd was warmed up, you close the curtains, change suits, then come back out with Liggins and do the main set. It might not fool anybody, or be intended to, but it could possibly get them a bigger fee from the club owners so they could advertise two “name” acts. So that’s how Modern Records got themselves a highly skilled saxophonist to join their label for a handful of sessions as 1947 drew to a close. What they DIDN’T expect, but got all the same, was a highly skilled full band to go along with him. You see, the guys backing Jackson were The Honeydrippers themselves, including Liggins on piano, one of the most popular bands in the country. Talk about a coup! Now the only question was what kind of music do you have them record. I think the answer should be rather obvious. With only a few weeks to go before the ban took effect they weren’t going to try and reinvent the wheel. For the most part the material from the sessions sounded a lot like the music they were cutting under Joe Liggins name. Polished, sweetly played, nothing too rowdy. In other words the antithesis of rock ‘n’ roll. But mixed in among them were a few opportunities Jackson took to stretch out and show what he was capable of when the reins came off and thanks to the sax-instrumental boon that was just beginning in rock ‘n’ roll Little Willie Jackson found himself, probably completely unwittingly, drafted into the ranks of a rock artist, if only briefly. Unlike most of the era who explored the same basic avenue, Jackson wasn’t playing tenor, which is something of a detriment. He shifts between alto and baritone on Jackson’s Boogie, taking the first extended solo on alto and then the second on baritone. That may explain why the effort lacks the raw paint peeling squeals and guttural honks that were becoming the norm for the tenor players, but then again, maybe he was still just a little too demure for that kind of showmanship, no matter which horn he was carrying. As a result the tune doesn’t grab you and hold you under, like an aural assault on the senses, but rather tries luring you in more with come hither glances. It works alright in that regard, clearly The Honeydrippers, veterans that they are, can seduce you with their playing, especially when given good riffs to lay down. And no, it’s not “too refined”, a common code word here for either a) too old-fashioned, b) too pop or, if I’m feeling particularly nasty, c) lacking in any sensible reason to expose yourself to that kind of tepid, watered-down garbage. This doesn’t have to worry about any of those offenses. Though somewhat restrained, it definitely swings along, utilizing both of Jackson’s horns well with the baritone taking the role of the more earthy tenor in the arrangement, and there’s even a nice guitar figure that pops up. As a rock fan this is something you’d be happy enough to hear at the dawn of 1948. Even decades later, while not exciting, it still retains a very real charm. But charm doesn’t necessarily equate to what we’re looking for here. Songs from rock’s early days need to be judged not only as being OF their time, but ahead of those times, or at least pushing the boundaries of their time forward. Jackson of course had no such ambitions. That he came close to inadvertently hitting on some of the attributes to make it appealing to a rock audience was a testament to the more boisterous sounds swirling around in the waning days of 1947 and which they merely picked up on when called upon to step outside their comfort zone. They did so well enough, but its mild pleasures are only fleeting when the more committed sax maniacs were already charting a more uninhibited course every day. So thus in the span of just one solitary review we’ll say both hello and goodbye to Little Willie Jackson, a visitor from another style who was just curious enough about what was going on in this part of town to wander over for a few minutes and give it a try. Finding it too uncouth for his sensibilities, and with no need to try and make his living in such a realm, he politely bowed out again and left it to others more adventurish than he to move beyond these tentative first steps into a deeper, darker alleyway of lust, sin and vice. For the musical desperadoes who’d be bold enough to mug you with their horns in the near future the payoff would be quite a lot richer than what Jackson came away with here. He was merely out to filch you, those who followed wouldn’t be content until you were sprawled in the alley, pockets emptied, mumbling incoherently, eyes spinning and mouth drooling, but maybe with a smile on your face. But then again, Jackson had a well-paying gig with Liggins to return to which would keep his career rolling for another couple of years on the charts, and another 35 years – believe it or not – as a live attraction, (he stuck with The Honeydrippers to the very end), so he didn’t need to take any more time off to stand in police lineups with the honkers and squealers who got hauled into the precinct for perceived “crimes against decent musical taste” that landed them on Rock’s Most Wanted lists. We’re glad you stopped in though, Willie. Even if only for a moment. 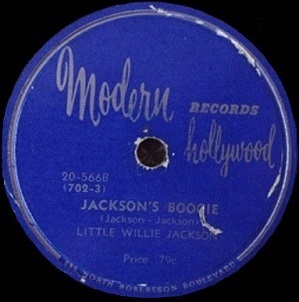 Leave a reply on "Little Willie Jackson: “Jackson’s Boogie”"